When I found out about The Mama Taco Towel, I knew that it was for me! After giving my daughter a bath, I often found my self fumbling with the towel a I tried to get her situated. This would always make me very nervous because being wet, I didn’t want her to slip out. I always felt that I wished there was a way that I could hold her and the towel would stay in place. Well, there is! 🙂 The Mama Taco Towel. Bath time can be a handful, between trying to get your child clean, dodging splashes, and holding on to slippery toys, as well as reaching for a towel without leaving your baby unattended. For mother of five, Déa Viola, reaching for a towel while guaranteeing her children’s safety wasn’t always easy. So she took matters into her own hands by developing The Mama Taco Towel? along with the lettuce leaf and the tomato wedge bath accessories, a hands-free towel that adds both fun and safety to bath time. This unique hands-free design, allows you to focus on keeping your children clean and safe, during bath time, in a fun and creative way. The Mama Taco Towel is a fabulous handsfree towel. By tying the straps of The Mama Taco Towel around your neck, you don’t have to worry about the towel falling and you can wrap your child confidently without worrying about slipping. This really takes the stress out of the bathing process. This towel is perfect for first time moms or 4th time moms and can used when they are a baby or as they are growing up as an toddler. As you can see in the picture, how easy this towel is. 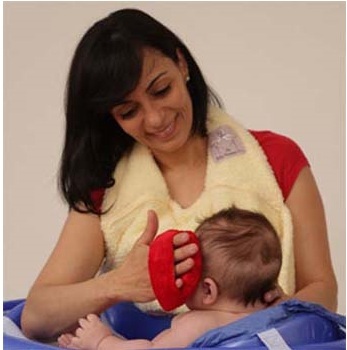 You can have it around your neck while your child is bathing so when they are finished you never have to turns your eyes away from them to get a towel. This is so important with a baby that you have the peace of mind not to have to focus on getting a towel ready but you can give all the needed attention to your baby. One of my favorite parts about The Mama Taco Towel is that it is incredibly soft and very absorbent. It is made out of 100% polyester which makes it easy to care for. My daughter snuggled up into it immediately. Its always hard getting them out of a warm bath into the cold air so she happily accepted the warmth of the soft Taco Towel. 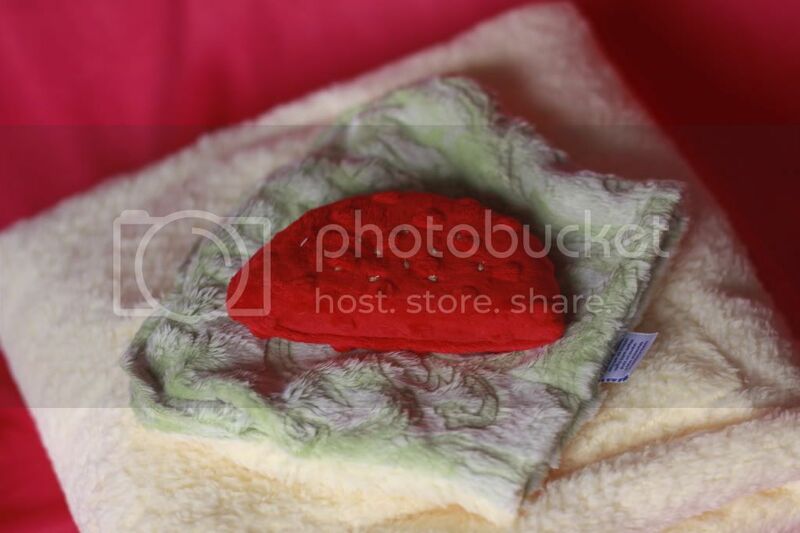 It also comes with the the most adorable LETTUCE wash your fingers and TOMATOES wash cloth and sponge set. Isn’t this just the most creative idea! 🙂 The product really is adorable. You can tell from the pictures how incredibly soft these are! Look how cute these are! The Mama Taco is an Award winner of the 2010 Huggies® Mom Inspired™ Grant Program, and 2011 PTPA Media Award Winning product and I can really see with with the level of creativity as well as the quality of the product. I really love it because it truly focuses on the importance of keeping your baby safe as well as happy. 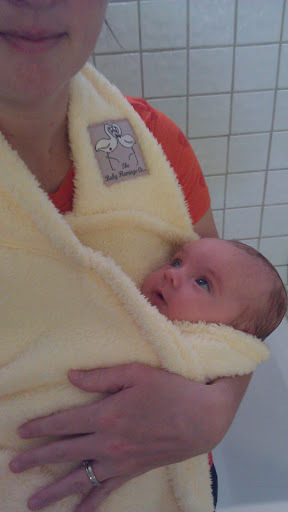 We have enjoyed using The Mama Taco, and really, look how happy and content my daughter looks being snuggled in it! This is such a fun, unique product that is perfect to help make moms life easier and more stress free. 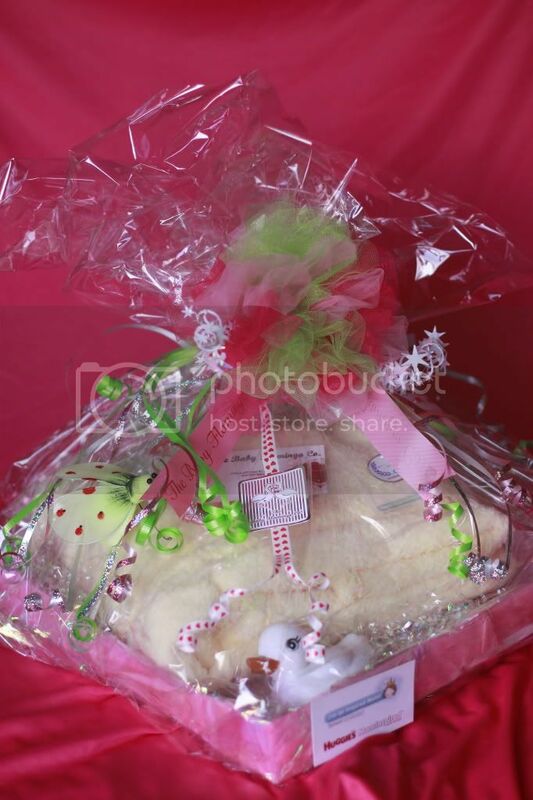 Everyone loves to walk into a baby shower with a unique gift, if you are one of those people , The Mama Taco Towel TM and Lettuce Wash Your Fingers and Tomatoes Washcloth and Sponge Set TM is perfect for you!